The printed version of Minor Acts of Heroism #1 is now on sale! The printed edition has all 26 pages of the story as well as a bunch of exclusive content. 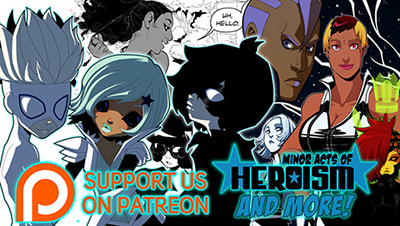 Please check out the SHOP for details, and to check out all the other Minor Acts of Heroism merchandise we have up! ALSO it looks like we hit the big 1000!!! 1000 fans!! Thanks SO much guys! You have no idea how awesome it is to us to have so many of you guys commenting and voting and liking the comic. It really keeps us going! So a billion thanks to you guys for sticking with us! Promise new pages are on their way soon! Must get a printed version. AAAHHHH!! UPDATE!!! (tackle-glomps you) EeeK! I wish I had money to buy the comic. I'll just settle for the online version. Or... will, if Paypal stops being a douche today. ahh! I need a printed version! Thank goodness I found this when I have some money!! I missed this! I'm glad you made it safely though Con time. I feel like I've just discovered the most awesome comic ever. Your artwork is so amazing, god, I'm jealooouss! I found 4 great webcomics today. So far, this is the best. And the acronym of this comic (M.A.O.H) is the name of a creepy manga I have, Maoh the juvenile something.